What’s Wrong With The Tau? I hear some form of this a lot. Any mention of overpowered factions, units that need nerfing, ‘What’s wrong with the state of 40K’ etc. brings up our Blue Goatfish Friends. And given the Eldar are indeed pretty unquestionably overpowered, you’d think there might be a grain of truth to this idea. The long answer involves math. Whose Afraid of the Big Bad Tau? I hear the Tau called out a lot for being OP, for ruining the game, for being one of the codexes that must be feared and dreaded and nerfed. That’s just not born out in the data. They’re a solid army, on par with Cult Mechanicus/War Convocation, Dark Angels or Chaos Renegades, but they’re not at the big kids table – that’s held by Space Marines, Eldar, Necrons, and Daemons. But that was just one (admittedly large) tournament, and the real effects of the new Tau units might not have been able to be seen yet. So I’m revisiting the question, with the results from two more recent tournaments in different parts of the country: The Broadside Bash and the Midwest Conquest GT. I’ve eliminated a couple single-army factions, like the Militarum Tempestus (sorry Reece) or Eldar Corsairs. The Tau are a popular army, but not nearly as popular as either the Eldar or the Space Marines, and on part with a number of other factions. If they were game-breakingly good, there’d be a considerable amount of selective pressure toward playing them (hence the popularity of Eldar in the tournament scene). There’s…well…there’s not. Alright, but what about how well they actually do? For this, I looked at the battle points for the two tournaments, normalized so that for each the winner got 5500 points so they can be analyzed together on equal footing. The median score is a super-even 3000 points. As we can see, there are some under-performing armies (Tyranids, my beloved Sisters of Battle, etc.) and some strong performers (Space Marines, Chaos Daemons, Chaos Space Marines, Eldar, Necrons and Imperial Knights). The Chaos Space Marines performance is driven by some very strong showings at the Broadside Bash – and ignoring the drama around the illegality of the winning list, it’s also not really a “CSM” list as much as it is an unholy mish-mash of CSM, KDK and Daemons. Notably absent on this list? Tau. They’re a solid, midrange performer, as they were in the LVO – it’s hard to end up at the bottom tables with them, but it’s also hard to end up at the top. 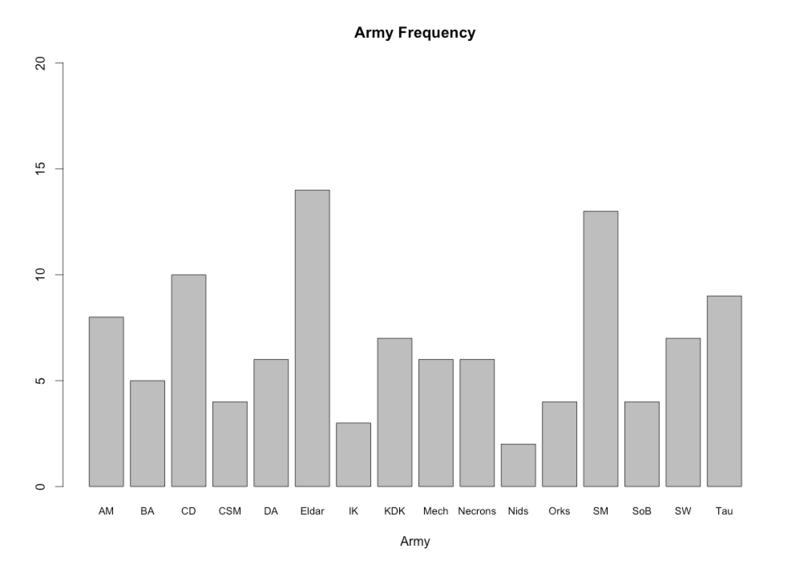 Looking at this another way, I used a regression model to predict the increase over the average score you could expect based on army choice for a number of armies, expressed as a multiplier (i.e. an army with a score of 1.50 should earn 1.50 times the points as compared to all other armies). Some of those armies are very strong – the Eldar and Necrons especially. The Space Marines are hampered by a lot of lower-performing entries, presumably people playing less-than-optimum Space Marine armies. But again, the Tau are far from the kind of multiplier the Eldar or Necrons see. They’re not in trouble (unlike the poor guard…), but they’re not setting the tournament world on fire either. Which brings us back to the core question: What is it about the Tau? 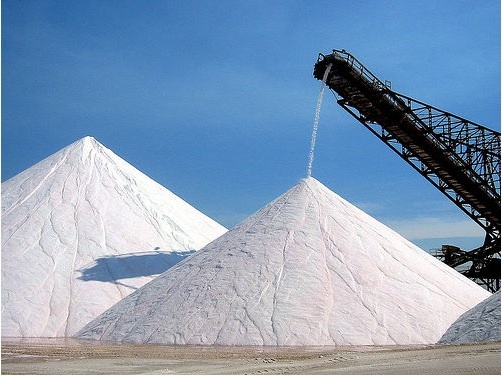 Why does every Tau release cause the salt to floweth over? Statistically, most of us are average players. That’s how averages work. And then a bulk of us (and I would include myself in this category) are below average players. The Tau’s wheelhouse is being a middling-good army. That means lots of us are playing at or below the level where the Tau can be expected to do well, and relatively few of us reach the rarified air where we’re good enough that they’re no longer a threat. There are mechanics in the Tau codex I’d define as “unfun” – things where really only one side of the battle is enjoying things, rolling dice, etc. The flexibility of the Tau in countering certain mechanics in the game (anything cover related, anything with a vulnerable rear armor value, etc.) can trigger a feeling of helplessness. And that’s not fun. Beyond that, because of the synergy in the Tau army and their weakness in melee, Tau success is very front-loaded. There’s lots of killing while the full army is up, marker lights are abundant, and units can support each other. So for the first few turns, the Tau roll dice, and their opponent removes units. Then, if their opponent survives that, the tables start to turn. When the Tau crumble, in my experience, they start crumbling fast. Which means that un-funness switches. Tau are being removed in droves, and then the final tally ends up being much closer than it felt like earlier in the game. And while in a game sense this might be balanced, two or three turns of unfun on both sides doesn’t average out to a fun game. In reality? I suspect it’s a combination of the two. But calling the Tau overpowered, or ruining the game? There’s really no empirical support for that. My friend plays Tau, and I play him a lot so I do a lot of Tau bashing for that reason, although its generally unfounded as we are evens when it comes to wins/losses. What kind of regression model did you use? Probit? I actually tried a game against a Stormsurge/Riptide Wing list a few nights ago. I almost felt guilty when he decided that he had to concede after his second shooting phase. Especially because I had largely considered Tau to be unfun to play against in the past. By the end of my first turn his few bubblewrap firewarriors were annihilated by my artillery, his markerlights were reduced by half, and I had dealt two wounds to his Stormsurge, though the four Riptides were untouched. In his return shooting phase he did two hull points to a Renegade Knight, and killed one Quad Launcher. By the end of my second shooting phase his Stormsurge had died to a lucky Quad Launcher shot and the combined fire of my Knights, and his markerlights were virtually eliminated. His second shooting phase saw one more hull point stripped off of my first Knight by his Riptides, and he called it there. My Knights were within charge range, and his MCs had very little chance of surviving a massive D Swording coupled with a direct bombardment into the fight. He actually told me afterwards that he finally understood how the armies he was playing against felt. It was an interesting experience. I agree that it’s more to do with how the army plays than it is its power-level. The ability to ignore cover completely, rather than the old one-marker-light-per-cover-point is bad because many units are designed to depend on cover. But that’s a result of the cover rules being a flat roll rather than the result of comparing the attacker to the defender, like the To Wound roll. Similarly Tau field a lot of units, Monstrous Creatures, that unlike Infantry and Vehicles, do not degrade their capabilities. By which I mean that infantry units lose members, and hence dice in combat and shooting, and risk falling back or being pinned. Vehicles may be stunned or shaken, immobilized, or have weapons destroyed before they lose their last hull point. A lucky shot may cause them to explode. Monstrous Creatures do not, and it makes play with them less interesting as a result. Finally, they combine game mechanics that reduce player agency with game mechanics that make the game slower (moving in multiple phases), and less interesting. It’s really no wonder they’re disliked, which is a shame because they also have lots of really interesting and unique features that can make for a really interesting game. These features include markerlights allowing seeker missiles to fire, and increase ballistic skill, and reduce cover (nothing wrong with reducing cover, but reducing it entirely so cheaply is bad); supporting fire, drones, and a relatively mediocre leadership. And yet Space marines have like 7 ways to ignore cover.. More with all their battle brothers that can come along.. While making their forces invisible, shutting down enemy psy, having like 4 ways to assault out of deep strike, and of course being able to make a 30″ move to assault turn 1 with any non-vehicle unit wanted. But yeah, markerlights are broken…..
You can’t assault from deepstrike at all and even if the rules did the stupid amount of overwatch fire would make it null and void, and invisible? That’s if you get it, when you can kill 200 points with 55 points of tau? And making I full squad of fire warriors firing 48 shots in the shooting phase/overwatch/snap? Hitting on 4-2/ignore cover? And that fire cap isn’t even fire warrior specific and I’d hardly say there’s even 7 ways to ignore cover that basic sms actually have. There are now a number of factions that can assault from Deep Strike. I think that Tau might be a stronger army than tournament results show. And I believe this is because they have no way to deal with a powered up deathstar. We have tools to utterly crush any tactic, interceptor, skyfire, ignore cover ignore LoS, etc. EXCEPT we can’t turn off a rerollable 2++ and praying for stormsurges to roll 6s to stomp doesn’t happen often enough to be a real tactic. This becomes a real issue when any 5+ round tournament will see you play at least 1 conclave powered star if not more. So you get a situation where the Tau player murders his way across 2-3 normal armies making feel bad experiences(you hit the nail on the head with the mechanics discussion) then hits superfriends where by law the game type will be kill points. Then you fire the entire army into the only unit on the table and do maybe a wound. :/ after that the Tau are back down at the mid tables making people hate their lives. One thing worth mentioning here: In a tournament you need to make either an all comers list, or anti-meta list. However the area that Tau excel more than any other army in 40k is tailoring lists to the opponent. For casual games where you know what army your opponent is going to play it’s really easy to make a list that is good specifically against it. And if your opponent has a limited pool of units to choose from it’s even worse. If you wanna be a jerk, and bring an army that specifically counters what your opponent brings, Tau has the easiest time doing that. And generally it’s hard to get statistics on casual games, but losing because every gun in the opposing army exactly punched your armor save is disheartening enough that you’ll remember the feeling and retain a negative association with that army. 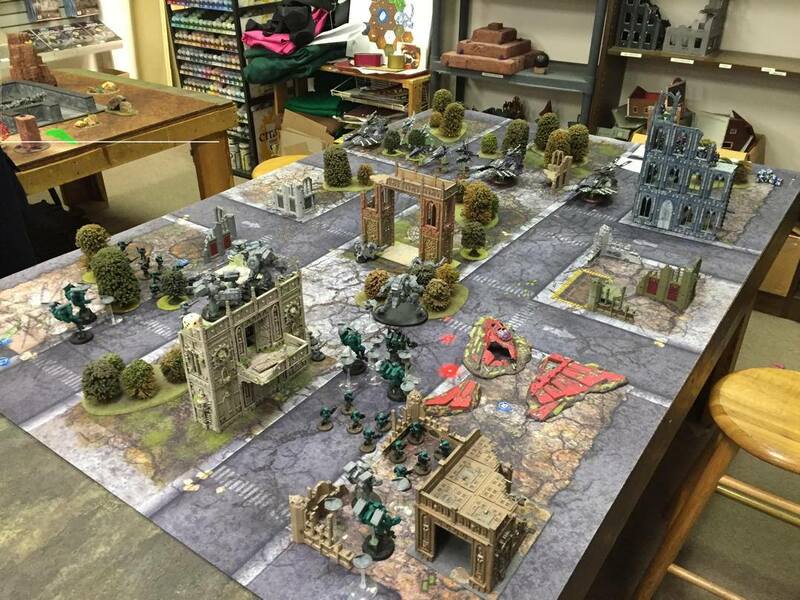 Agreed – I think casual games are, unfortunately, far and away what the Tau are best at. Personally my beef with them is that I prefer to play a footslogging ork list and all 160+ guys are dead before I can reach the other side. I rarely win first turn so they just make sure to kill all the lootas and such with range first. It’s a solid thing on their part but when I need cover saves and my vehicles when I go walker heavy are rear armor 10 I lay down and pick up models and they kill stuff. I agree with the unfunded bit with an added caveat. Due to the ability in the beginning of the game to hit and hit hard, ignoring nearly all saves and in some cases even line of sight, that means the opponent can’t bring any big important units. For example, a CSM demon prince of nurse sitting hidden in ruins behind a bunch of other units unseen to all but some drones, and he’s still gone before the CSM player has a chance to move. The recent 40k fan survey showed that there was a bias for Tau and Necron hate among less experienced players. The more experienced the player, the less likely the were to rate Tau and Necrons as the most powerful 40k army. Eldar on the other hand were universally loathed, even by Eldar players. I recently played against a stormsurge, 3 riptides, 10 kroot, buffcommander with 8 markers and 2 extra crisis and 2 skyrays with my Ravenwing army (not superfriends). And he had an inq with servo skulls and a bunker. I was lucky to get first turn so i could at least do something. The problem with this list is that he can shoot everything, since destroying a bunker t1 is almost impossible and with all 8 markers hitting your most precious unit while the rest of the crisis rips my support squadron apart. Ignoring ALL cover for only 2 markerlights is just bs and should be nerfed. Paying 1 markerlight for -1 cover seems legit. The rest is okay imho. ‘Tau have bad BS’ – cheap marker lights, tonnes of shooting and hit on rear armour. ‘Just shoot all the marker light units’ – While I’m doing that I’m getting creamed by the rest of the army which is now BS5! ‘Tau units cost a lot of points’ – Toughness 7 monstrous creatures that have access to shield drones and insane cover saves. Why are they MS and not vehicles? ‘Just get them into CC and you beat Tau’ – Get into CC? Just how do I do that? 2 turns of shooting, they move in their CC phase, easy access to interceptor and half the army gets to shoot at my charging units with multi-shot twin linked weapons. Are they horrible to play against? Definitely. I think it is far more about the player than the army. As a fluffy hard counter to the jet bikes, how about the Dark reapers? behind cover, ignore jinking ap3? they are the same price… as part of an aspect warrior list, you could have a fun list that is a very potent counter to the tau battlesuits. Two units of DR, two of warp spiders, two of swooping hawks, Eldrad or a vanilla farseer are fun support for the reapers. Banshees ignore overwatch if they can be delivered safely. but their mask can go onto an autarch that can then join other units. I prefer to double up with units, essentially to deal with spam lists and 2+ cover saving nidzilla (Seriously, stealth, shroud, behind gaunts on carnifexes makes them pretty scary). however I feel that more than two of a unit is usually excessive. Yes I am an Eldar player, so I am automatically assumed to be a cheese monster, however I was 11 the first time I bought them, in 3rd ed. I like the story and fluff. the models are cool and they are not space marines. I do like to win occasionally so I can’t rely on a harlequin army (From the days of Gav Thorpe’s list) on its own I also play AM and DE (GW’s Ginger haired stepchild). both are considered underpowered compared to Tau, Eldar and Necrons. I still think that the most male bovine excreta comes from the space marines. Grandmaster not hard enough? give him T5, Eternal warrior, 2+/3++, IWND and a thunder hammer. SM is easily one of the strongest lists, with a ridiculous number of kits (around 170 items on the gw site), models and Forge world love. Tau is a bit cheesy against some otherwise powerful combo’s that people spend lots of points to set up. The real issue in a tourney that can make Tau overpowered is time limits. I played in a tourney where it took 30 mins for set-up and then out of the remaining 2hrs we got 2 turns each. Tau lost, 1pt to 2 out of a possible 30+. Tau ate up nearly 1 1/2 hours of that clock on their turns. So I can see where people complain. I can’t see where the Tau are inherently more likely to take time than any other army, and indeed I suspect they take *less* time than some others (Psychic-phase heavy armies come to mind). I was thinking the first list from this post: http://variancehammer.com/2016/07/19/two-novelty-space-wolves-lists/ but yeah, hordes of IG bodies will do it too. The 40k survey earlier this year showed an interesting anomaly with the Tau. 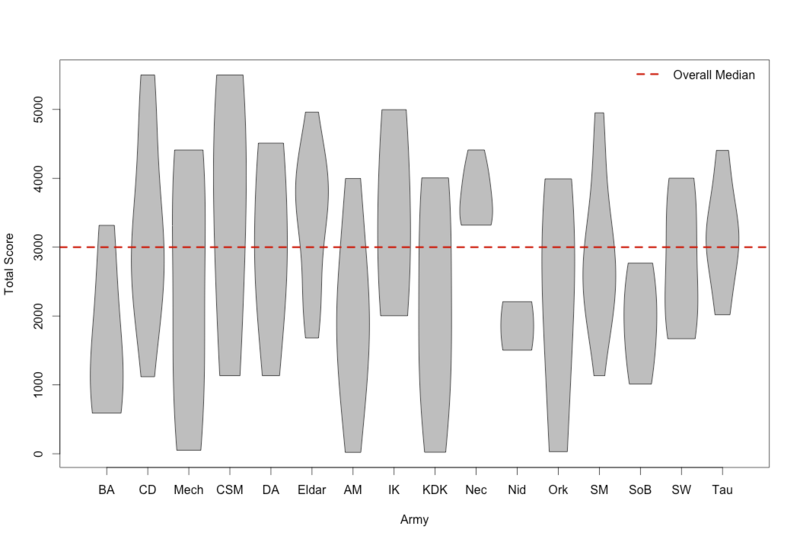 Tau were voted fairly high on the powerful army graph, but the vast majority of the players voting for Tau had < 5 years experience playing the game. As players get more experienced with the game Tau are not perceived as being nearly as powerful, so it would seem the secret to defeating Tau is experience.